This is a solid start to a brand new series trilogy. And I think it is the first time I have read a gaslight fantasy. What's that you ask? Well, thanks to Wikipedia, I can tell ya. It's a fantasy set during the Victorian era with a nod to the gothics. (You can read more about it here.) Scott does a nice job of creating a darkly evocative atmosphere in a world populated by the Beast Kind, the Fae, Vampires and Humans. The story begins during what is known as a treaty year: that time when the four races negotiate the terms, trade and territories that allow them to co-exist in some semblance of peace. Transgressions by any of the races can result in a loss of privileges. Since the treaties will last for three years, each race has a lot at stake regarding the outcome of the negotiations and so must keep hidden any nefarious shenanigans lest they lose entitlements. Assassin Lily first meets Simon when her owner, the Blood Lord Lucius, sends her to kill him. Lily is a wraith who derives her powers from the shadows and the night. Wards cannot stop her, magic cannot detect her, and no material is a barrier when her powers are at their height. All of which makes her very effective at her job. But Lucius has left out an important detail about her current target: Simon is a sunmage with the ability to nullify the shadows that give Lily her powers. Normally, sunmage's are healers but before choosing the healing path, Simon was a Templar. His fight training plus his unique powers make him more than a match for Lily and he is able to disarm and restrain her. At a stand off, the two end up talking through the night until the sun rises, caging Lily’s powers, and Simon is able to safely let her go. Out of necessity, Lily has learned to hide her vulnerabilities in attempt to survive in a world that hates her kind. I thought the author did an excellent job of depicting the character. Lily is a battered woman and her reactions and behavior are informed by the treatment she has received since being bought by Lucius. So she’s been abused for pretty much her whole life. BUT while she is a victim, Lily is not weak. She will do what she has to in order to protect herself. If that means killing whomever Lucius bids her to, then that’s what she will do and do it well, despite not being a natural killer. She kills because she has to. It is the only thing that makes her a valuable commodity. She keeps her head down, sticks to the shadows, does what she's told and endures much in order to survive the only life she has ever known. She knows little about who she is or even what being a wraith means. She has trust issues because she has learned the hard way that she can trust no one and a damaged soul who will do what she must to survive. Watching Simon and Lily find there way to each other made for a good read and I appreciated how, despite the instant bond, the author took the time to build the trust between them. Too often, in my experience, instant bonds are short hand for You-Are-So-Super-Special! Let Me-Forget-Everything-Life-Has-Taught-Me-And-Bare-My-Soul-To-You! Considering Lily’s past, that wouldn’t have worked for me. I also thought Scott did a nice job with the secondary characters, who seemed like real people to me. Even crazy-assed Lucius. In the hands of a less talented author, he could of come across as just another cardboard, evil-for-the-sake-of-evil villain but I thought Scott’s depiction was effective. However, I found the first person narration, which alternates between Lily and Simon, a little jarring. I’d get sucked into the story then the point of view would change and I’d be like - wait, what? Oh, it's a different person narrating. It sometimes took me a half a page or so to figure it out. Now I don't mind alternating first person narratives. I know some people do but not me. I just wish it had been a little clearer as to who was narrating at the moment. Especially because sometimes the narrator would switch mid-chapter. It kept popping me out of the story. I also would have liked more in-depth world building. It took me awhile to figure out when the book was set. (I ended up going to the author’s website to find out.) The picture on the cover is so contemporary looking that I would never have guessed it was set during an alternate Victorian era. (I know genre fiction covers are not known for their accuracy but still…) Hopefully, there will be more in-depth world building in future books. I want to know more. What I do know, I like. Ultimately, I dug this book. The moody atmosphere, the tortured (but not weak) heroine, the paranormal politics, and an author with a distinct voice and style were right up my alley. This is a promising start to a new series and debut author M.J. Scott is a writer to watch. 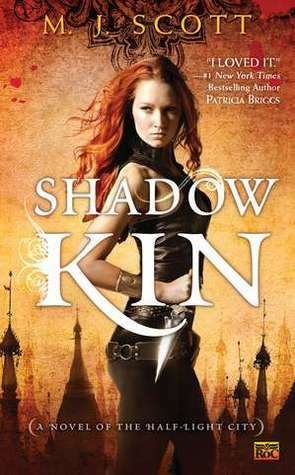 The second book won’t be out until June 2012 but I already plan on reading it.